Caught the last part of Baltimore's ultimate otaku convention today. While I have my bones to pick with certain aspects of the scene, the overarching importance of a major event promoting Japanese pop culture can't be denied. The JRock panel this morning featured panelists from the information hubs JRockRevolution and Tainted Reality. While the former cultivates a fan community for JRock in the US, the latter promotes nation-wide tours of Japanese acts, and each produces a TV show and radio show, respectively. The run down of the latest news is as follows -- JRockRevolution's new show on the Anime Network, Bento Beatbox, features up-to-the-minute sonic delicacies from Japan. Clips provided during the panel ranged from music videos by D'espairsRay and Gackt, to an interview with up-and-comers L.M.C. Tainted Reality is about to launch a record label, and have also started working with the enigmatic DJ Sisen, an industrial spinner who I caught in leather mask and neon synth plastic extensions at Tokyo Dark Castle a few years back. 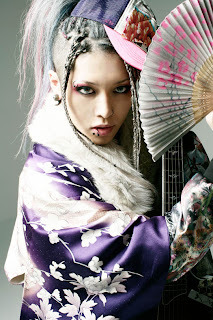 An interview with Dir en Grey, and a show review of D'espairsRay.